Coverage: Live on BBC Two Wales and online, BBC Radio Wales, Radio Cymru plus live text commentary on the BBC Sport website. Manager Chris Coleman is prepared to leave Gareth Bale out of any friendly Wales play next March if there is the danger of him playing too many matches. The forward, 26, is rested for Wales' friendly with the Netherlands on Friday after discussions with Real Madrid. If the Spanish giants are chasing silverware on several fronts come March then Coleman will again be prepared to put Bale's long-term fitness first. "I'm not going to say: 'No, he's playing [for Wales]'," Coleman said. 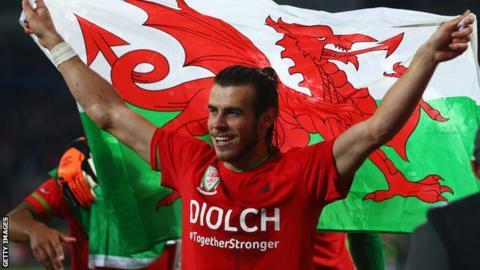 Wales will be preparing for Euro 2016, while Real could still be involved in the Champions League, as well as chasing trophies on the domestic front, when there is an official Fifa window for matches on 21-29 March. Bale is expected to return for Real against Sevilla on Sunday night after being sidelined for three weeks with a calf injury and Coleman is keen that his star forward's fitness is balanced with Wales' preparations for the Euro 2016 finals in June. "If March comes around and Baley has had a lot of football, and Madrid say, 'Look, he's fit, but we are in the semi-finals of the Champions League, or whatever', then I'm not going to say: 'No, he's playing'," Coleman said. "When you start talking like that - when you are that dogmatic - that is when it bites you on the backside further down the line. "We have never done or put them in that position. Even now, they have not said he can't come [against the Netherlands] but I understand what they are thinking and that's why he's not coming." Bale has not played a full game for his club for two months because of his ongoing calf problem. But Coleman praised the cooperation between the Wales camp and Real over managing the player's welfare. That is in contrast to the situation with Aaron Ramsey, which has seen Coleman and Arsenal boss Arsene Wenger involved in an ongoing spat over the midfielder's hamstring problems. "Baley went back after the last camp, trained for two or three days, and then broke down," Coleman said. "Madrid immediately came out and said: 'That's not Wales - he got injured here'. "That was good to hear, because they could have used us as an excuse if they had wanted to, but they never did." While Coleman may be prepared to juggle his resources in friendlies during the club season, the Wales boss wants two warm-up games just before the start of Euro 2016 in France on 10 June. "We will try and play two games if we can between May 28th and June 10th," Coleman said. "It is not very long between the Champions League final and the start of the Euros but I would imagine Baley would figure for us. "I would be surprised if his last game for us before France is the Andorra game [last October]. "I would not expect that. He will want to play himself."